How the trade war is hitting home for average Chinese in Beijing and beyond. However, reports from some business owners in Beijing and Yiwu in Zhejiang province support on a microeconomic level key statistics on the Chinese economy at the macroeconomic level, as reported by the South China Morning Post. 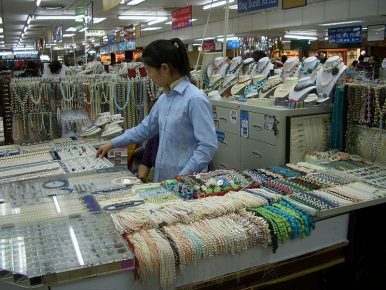 At Hongqiao, an adjunct building houses vendors of high-value jewelry. Gold, precious and semi-precious stone, and pearl jewelry are sold here for up to tens of thousands of Chinese renminbi (RMB) per piece. But, according to one business owner, Mrs. Lan, business in that sector has plummeted. In Shanghai, the domestic airport was packed, and high-speed trains going south were full. But in Yiwu, home to the largest small commodities market in the world, the halls were quieter than usual. So in Yiwu, the appearance of few people can be deceptive. The small shops, normally ranging from 5 to 15 square meters, do most of their business online, and that primarily on WeChat, China’s homegrown media platform, which has penetrated all levels of Chinese social and business life. Therefore, the Yiwu market shops may seem sleepy at times, with children playing freely in the aisles, and vendors lounging back at small desks watching kung-fu movies. But the one to two orders a week that come in online buying a container-full of merchandise are more than enough to satisfy business requirements, as well as the payments to the shadow bankers who are often the financiers of the shops they rent or buy, at up to 1 million renminbi per year. But shop owners, such as Mrs. Lou, say that those bulk wholesale orders are slowing, as well. Mrs. Lou sells plastic, rhinestone-encrusted tiaras for little girls. She has not had a big order since August, and therefore has plenty of ready merchandise to offload. Other vendors throughout Yiwu echoed similar concerns. “It is our Middle Eastern and African customers who are keeping us going,” said one vendor, who sells toys, angel wings, and other children’s merchandise. But it is not until one begins to talk to those on the lowest margins of the economy that the situation begins to come into clearest relief. Taxi driver Tao says that Yiwu is the only place where he can earn enough money to send back home to the rural area outside of Yichang, Hubei province, where his small daughter and both of his parents still live. Go to Yichang, 1,000 kilometers west of Yiwu, and you will find only two types of people, Tao says: old and young. People his age, in their 20s and 30s, have all left. There is no work for them, or at least not enough to meet the requirements of modern Chinese society, such as providing a “caili,” or dowry, to a prospective wife’s family. Questioned on the details, and how his economic situation has been affected by the geopolitics of the trade war, Tao says that he doesn’t understand the trade issues, but he does know that his taxi business has suffered dramatically over the last few months. Fewer people are coming to Yiwu to shop, he says, and that has driven his income down. He is already driving 15 hours a day, seven days a week (a very real number to which taxi drivers throughout China have attested for decades), with only ten days off a year for Chinese New Year. Tao says that his take-home income in a good month is 10,000 RMB. In recent months, that income has dropped to 6-7,000 RMB per month, reducing his income by up to 40 percent. Asked whether the decrease in visitors could simply mean an increase in those who are buying online, a trend in line with both wholesale and retail buying behavior around the world, Tao said he does not think so. Showing a savvy he claimed not to have, Tao points out that if online business is taking over, then why are Yiwu property prices rising astronomically? A flat, he says, in the central business district of Yiwu, is now up to 30,000 RMB per square meter. That means, in hard currency terms, that a 100 square meter apartment, sold as a bare-plaster wall shell with no interior fit-out whatsoever, not even a toilet, costs well over $400,000. No, he said, the slowdown is real. Businesses are losing sales. Incomes for people like him are dropping. An explanation of the loss of American jobs and stagnating wages in the United States fell on decidedly deaf ears. China Ready to Reach a Trade Deal With USAs US-China Prepare for Next Trade Talks, Trump-Xi Meeting Remains UncertainChina Plays Down Liu He’s Meeting With TrumpChina Slowdown Rains on Party’s Parade2019: Dog Year For Asian Economies?